Aquaculture refers to the breeding of fish and other aquatic animals for use as food. Aquaculture has long been practiced in China and other places in eastern Asia, where freshwater fish have been grown as food in managed ponds for thousands of years. 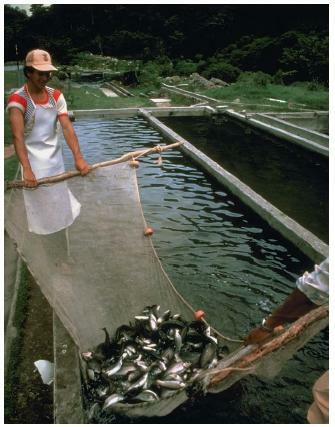 Since the mid-twentieth century, however, the practice of aquaculture has spread around the world, with many new species of freshwater and marine animals being cultivated. By the late 1990s, aquaculture produced some 20 percent of the fish eaten by people around the world—over 20 million tons. The principle goal of aquaculture science is to develop systems by which fish can be grown and harvested at large rates, while not causing environmental damage in the process. The oldest fish-farming systems were developed in Asia, and involved several species of freshwater fish. The first writings about the methods of fish farming date from about 2,500 years ago. The first species to be grown in aquaculture was probably the common carp, a fish native to China but now spread throughout the world. Fish farming involves the management of all steps in the life cycle of the cultivated fish, from the production of eggs through the growth and eventual harvest of a high-quality, mature fish. Fish are most commonly raised in artificial ponds or in cages or pens set into larger bodies of water, including the ocean. The fish are fed a nutritious diet—sometimes to excess so they may grow to their maximum size—and are administered medicines to maintain their health. Additionally, chemicals are frequently applied to their cages to prevent the fish from being eaten by predators. When the fish are mature, they are carefully harvested and processed. In North America and Europe, the most commonly cultivated freshwater fish are species of trout, particularly brook trout and rainbow trout. Other cultivated freshwater fish include channel catfish and the common carp. Saltwater or brackish (slightly salty) water species frequently cultivated include salmon and trout. Varieties of these are Atlantic salmon, Pacific salmon, and brown trout. Invertebrates are animals that lack a backbone or spinal column. The most common aquatic invertebrates cultivated around the world are species of oysters and mussels. In Asia, many species of oriental shrimps are bred, along with giant freshwater prawn. In Europe and North America, lobsters and various species of crayfishes are also cultivated. Although aquaculture provides nutritious, high-quality foods for humans, it also severely harms the environment. When natural ecosystems (communities of plants and animals) such as tropical mangrove forests are turned into aquacultural systems, for instance, many native species in those ecosystems are displaced. Any remaining native species and the surrounding waters then face the threat of contamination from the drugs and toxic chemicals used in aquacultural management. im a person that have a 1-acre of land which is swampy so i was thinking of starting a fish farm which my children and can manage,so fresh water would be preferable.i need to know how i can buy fish eggs to start with.